Grugan Hugh Seskinore died peacefully on the 23 August 2018 in the Omagh Hospital and Primary Care Complex surrounded by his loving family. Brother of Charlie, Bridget (O’Keefe), Rose (McCann), and Annie (Taggart) and the late Isa (Loughran), Mary (McKinley), Willie, Owen and John. 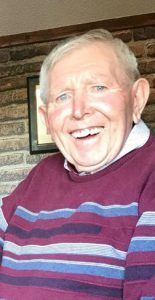 Hugh will leave his late residence 41 Freughmore Road, Seskinore on Sunday 26th August at 10.15am for 11.00am requiem mass in St Lawrence’s Church Fintona, burial afterwards in St Malachys Church cemetery, Seskinore. Family flowers only. Deeply regretted by his loving brother, sisters, in-laws, nephews, nieces and entire family circle. St Padre Pio pray for him. Our Condolences to the entire. Family. Thinking of you all At this sad time.